Since pets can’t say how they’re feeling - it’s usually how they look or act that tells you something is wrong. You play a key role in helping your pet combat illness and stay as healthy as possible. 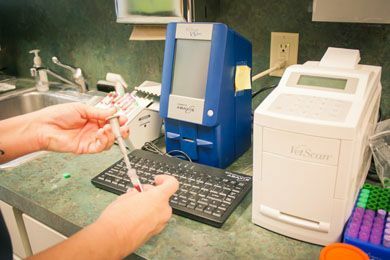 Patton Chapel Animal Clinic has an in-house laboratory to perform important diagnostic testing for your pet. Our preventative care blood tests can provide information about your pet’s liver, kidneys & pancreas, blood sugar levels, white & red blood cell and platelet count. Diabetes, kidney, heart & liver disease may not show symptoms at onset. Identifying possible diseases and complications early allows us a better chance to develop a treatment plan for your pet.